The Ukrainian comedy “Crazy Wedding” produced by Prototype Production and FILM.UA Group with the support of the State Film Agency of Ukraine will be screened in Australia. On December 7—16, the film will be displayed in the Ukrainian Cultural Center’s Cinema in Melbourne. Australian viewers will have a chance to see the #BestComedyOfTheYear in the Ukrainian language with English subtitles. “The Ukrainian community of Victoria is very pleased to represent and promote the Ukrainian film industry in Australia. 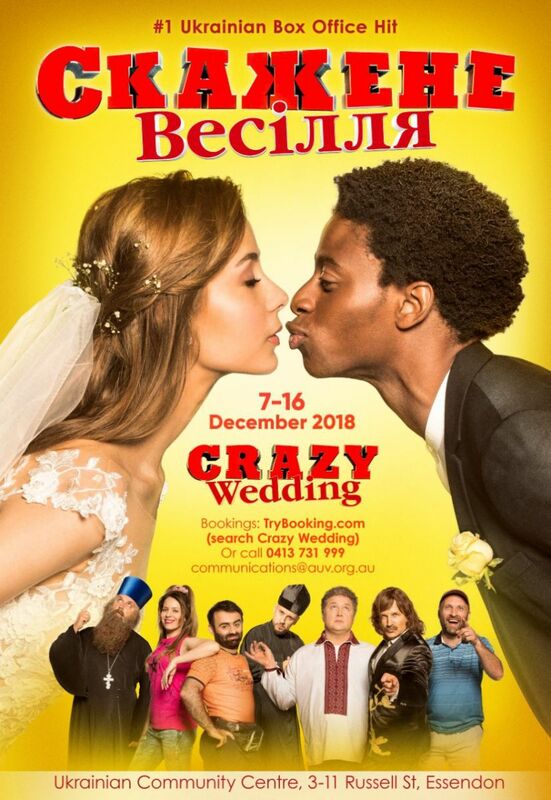 Starting with December 7th, Melbourne will be the first city to host the first screenings of the best-grossing Ukrainian film, a comedy film called “Crazy Wedding”.. Ukrainians and Australians can't wait for the premiere. This is a genuine Ukrainian folk comedy, and we are happy to be a part of this project ”, said Liana Slipetska, deputy head of the Ukrainian community in Victoria, who organized the screenings. Learn more about the schedule, ticket prices and other details at this link. Follow our updates on the Facebook event page. In addition, on December 9 at 14:00 a commercial screening of “Crazy Wedding” will take place in the “Ukrainian Cultural Center” Cinema in Brisbane, the capital of the Australian state of Queensland. The event is organized by the Ukrainian community of Queensland. As you may remember, “Crazy Wedding” made its stellar entry into the Ukrainian box office on October 4, and throughout the first three weeks has set an absolute record in terms of box office revenue among all Ukrainian films, and later in terms of number of viewers as well. At the moment, the film’s box office revenue exceeds 54.6 million UAH, thanks to 653,575 viewers who came to see the film. The theatrical run of the #BestComedyOfTheYear continues. The main roles in the film were performed by Nazar Zadniprovsky (Vasyl Seredyuk, father of the bride), French actor Jimmy Voha-Voha (Francois, the fiancé), Polina Vasylyna (Katya, the bride), Lesya Samayeva (Galina, Vasyl’s wife), Alexander Kobzar (Taras, Vasyl’s Neighbor), Vira Kobzar (Oksana, the neighbor’s wife), Inna Prykhodko (Olga, the neighbor's daughter) and Aram Arzumanyan (Ashot, neighbor's son-in-law) and others. Also, the stars of Ukrainian show business also joined the professional actors: Potap and MONATIK played the roles of Father Evlampy and deacon Pilipon, the crazy producer Yuri Gorbunov played the role of toastmaster Nazar Zapukhlyak, Oleg Vinnik made his debut in Ukrainian cinema, Ukrainian YouTube star Oleksiy Suprun (Petro Bumper) and the stars of the “League of Laughter” - stand-up comedians from the “Different Trio” Anastasiya Orudzhova and the “Zahoretska Ludmila Stepanivna” duo - Victor Rozov and Svyatoslav Antipov. Film Outline: Vasyl Seredyuk, the director of a local natural history and crafts museum, sent his daughter Katia to France to study. But little did he know that during her stay she had become engaged to a French doctor — heart surgeon Francois. “The Seredyuks are a European family!” — this what what literally every single neighbor heard from Vasyl. But he was more than a bit surprised to find out that the son in law of his dreams is a Frenchman with African heritage. In light of this, Vasyl decides that planning for the wedding to fail sounds like a great plan. But when true love is at stake, no cunning plan can possibly succeed.